Datapath introduced its new iolite 12i controller at InfoComm 2018—adding to its broad range of video wall management hardware with a controller designed for corporate and commercial applications. The iolite 12i can drive up to 12 HDMI screens in its stock configuration at HD 1080p, giving the flexibility to offer a wide range of display options. Small but powerful, the iolite 12i is comfortable running 3x2 video walls for a boardroom, a welcome screen and TV wall for a reception, or 12 menu boards in a restaurant. It runs unobtrusively, with its quiet operation and small footprint, making it ideal for the office environment. It also includes a rack mounting kit to enable the 2U chassis to fit in a server-based control room. 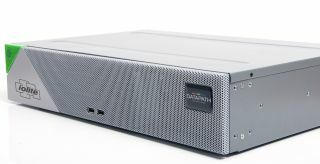 Datapath’s iolite 12i is available now. Visit www.datapath.co.uk or contact your Datapath rep for more information.